SPECIAL: START OF THE FIGHTBACK? Tony Blair expected the run-up to the election to be smooth. He planned a May election with little opposition. The Tories remain an appalling prospect and the trade union leaders were, on past performance, likely to keep quiescent. A few sops to public opinion in the form of more health and education spending were meant to allow the Labour activists to claim that their government genuinely did make a difference. But all has not gone according to plan. While the headline poll figures put Blair massively ahead, the disquiet among Labour supporters on the ground and the swelling level of protest tell a different story. What has brought about the change? There has been a growing sense that protest works. The partial successes last year of the lorry drivers and farmers in the fuel protests, and of the pensioners in forcing the government to concede much greater increases to state pensions than it had wanted, both sent signals that the government would back down if it was forced to. The successive attacks on the car industry in Britain led to over 10,000 demonstrating in Luton. The similarity of the attacks across the working class have led to a greater sense of generalisation--the question of privatisation, of job losses, of downsizing now goes across the whole of the working class, meaning that people are far more likely to make the links with other struggles. All of this has led to a far greater level of activity than might have been expected so soon before the election. Even the trade union leaders have been prepared to sanction some activity despite their unwillingness to embarrass a Labour government at election time--perhaps encouraged by the sense that it is virtually impossible for the Tories to win. 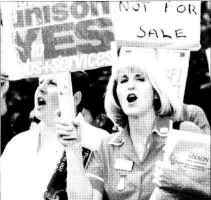 As well as the demonstrations over the closure of Vauxhall's Luton car plant, there has been an extended three-week strike against privatisation by workers at Dudley hospitals, a series of Post Office disputes and a possible strike over pay, a mass lobby of parliament organised by Defend Council Housing, uproar in the schools over teacher shortages leading in some cases to children being placed on a four-day week, mass petitioning to campaign for the railways to be renationalised, and a yes vote in a ballot among tube workers for strike action against privatisation. These and the many other local campaigns have begun to change the atmosphere politically. It does not take much for the different issues to come together in an offensive against government policy. By the last week in January, in London alone, there were plans for three one-day tube strikes, a three-day strike of council workers in Hackney--both against privatisation--and a rally of over a thousand teachers to protest over pay. The explanation for the growing resistance lies in the Blairite pursuit of the neoliberal agenda. Working people now have to pay for basic requirements which once were regarded as universally provided through taxation or available cheaply, such as decent pensions, free higher education, cheap housing and public transport. Areas still provided by the public sector, such as the health service and the state education system, are both in crisis as a result of serious underfunding. The Blairite solution to their problems is more privatisation and more subjection to deregulation and the whims of the global market. Resistance to this path is strengthened by the existing examples of Blair's 'success'--especially the rail chaos of recent months. Had this been caused by industrial action, there would have been uproar among the ruling class--as there would have been had striking teachers led to children being sent home or striking hospital workers led to operations being cancelled. Instead our rulers carry on with the same failed methods, trying to privatise everything in sight and pumping another ££1 billion of public money into Railtrack. That these measures are becoming, if anything, even more unpopular is evidence of the traditional social democratic attitudes among the mass of people in Britain. Around three quarters want the renationalisation of the railways (interestingly, a survey of finance directors showed the exact reverse--with three quarters of them against renationalisation). Most people want more public spending and are willing to pay more taxes if necessary to pay for it. The majority no longer consider the unions too powerful. This mood is well to the left of all the established parties. These generally social democratic attitudes do not mean that right wing issues cannot sometimes win support. Blair repeatedly gives ground to the right and often opens up the way for right wing arguments. Labour's cowardice over foxhunting, its scaremongering over law and order, its racism over asylum seekers, has played to the most reactionary ideas. But even the worst moral panics tend not to generalise into a more right wing offensive. This partly explains the weakness of the Tories: the mood on the ground is too collective and too left wing for the Tory Party to gain advantage at present. Local Labour parties and trade union activists are in danger of drifting apart, says a survey of union branch officials published in Labour Research magazine. It reveals that Labour is unlikely to attract new union branch affiliates in the near future. The main reason given is dissatisfaction with the Labour Party and its attitude to unions. The survey also showed that less than a third of affiliated union branches have a regular report back from CLP delegates and 15 percent never have one. University vice-chancellors have been labelled 'fat cats' by the unions. The typical vice chancellor now earns ££110,000 against lecturers' average of ££24,000. John Quelch of the London Business School earns ££266,000 a year. People living in inner London need at least ££3,287 a year more than those living outside the capital to compensate for the higher cost of living. London is now the most expensive city in Europe--with basics such as food, transport and housing taking a huge slice out of poor people's budget. It is remarked around the world that the similarities between the main bourgeois parties are much greater than their differences. The US presidential election was characterised by virtually identikit candidates and policies. Blair's government has followed through policies which even the Tories would not have dared to pursue. The manifestos on which each party will fight the election look like being remarkably uniform. They will fight to be the most effective on law and order and on implementing the wishes of the market. They lecture on prudence and economy for the poor and the public sector while allowing the most obscene accumulation of private wealth that the world has ever seen. This opens up a space to the left electorally which relates to the values of traditional left or socialist voters while at the same time articulating the disgust widely held with big business and the governments which serve it. Ralph Nader's campaign in the US was squeezed by the closeness of the vote and by left Democrats pressurising his supporters to vote Gore. Nonetheless he was able to achieve a significant vote in some areas. In Britain the Socialist Alliances in England and the Scottish Socialist Party in Scotland have begun to put themselves on the map electorally. The SSP has a Member of the Scottish Parliament, Tommy Sheridan, and has held its deposits in the last two Westminster parliamentary by-elections. In every recent by-election the left parties have won over 5 percent, a remarkable achievement given their lack of resources and publicity. There looks like being around 150 left of Labour candidates in the general election. The socialist electoral challenge is of course very different from the other parties in its orientation. Far from being opposed to the various campaigns it aims to support them and to see them as a way of helping to build electoral support. It is crucial that we have this socialist challenge now--it is not only about organising but also about presenting a political alternative to Blairism inside a working class movement on the road to recovery. At some time during his stay in Northern Ireland a strange thing happened to Peter Mandelson. He lost what was left of his conscience. When he resigned two years ago after his vast loan from former Paymaster General Geoffrey Robinson was revealed, he was subdued, almost contrite. He applied what became known as the Hartlepool test--what would the ordinary Labour voter in poor old Hartlepool make of their MP borrowing ££400,000 from a rich pal so that he could buy himself a decent house? The answer was pretty obvious. Mandelson accepted it, and left the stage. Apply the same test to the recent hullabaloo about the Hinduja brothers, and it goes something like this. What would a manual worker in Hartlepool make of his MP intervening on behalf of a billionaire who had been a generous supporter of Margaret Thatcher and who was being investigated by the Indian authorities for his part in a notorious arms scandal? The answer, if anything, would be even more unprintable than the answer over the Robinson loan scandal. But Peter Mandelson has been so long in office that he has lost sight of his own simple test. So, it seems, have the entire media. So the questions which are being asked--by the newspapers, television, and mainly by the Tories, who are as deep in the Hinduja mire as anyone else--are about which ministers rang which colleagues, exactly what they said and whether their behaviour contradicted some legalistic code drawn up by MPs with the purpose of shielding them from public criticism. On this level it seems to be important whether it was Mandelson himself or his private secretary who rang the Home Office to ask about the Hindujas' passport. This is an entirely trivial matter. No one suggests that the private secretary would have made such an inquiry without her boss's instruction. The point is that at a time when the Hindujas were offering vast sums to bolster the ghastly Dome, for which Mandelson was the responsible minister, Mandelson, or someone on his behalf, tried to secure for the billionaire the British citizenship which is craved by millions of desperately poor people all over the world. That is not a question of detail--who rang whom and when. That is a simple question of principle--of attempting to secure for a very rich donor a deeply-prized privilege. The Tories, of course, are having a field day at Labour's expense. Their jubilation will last as long as it takes to find out and publish what is already widely suspected--that the Hindujas were generous contributors to Tory Party coffers, were profound admirers of Margaret Thatcher, and were supported in all sorts of ways by senior Tory politicians and functionaries. The charge against Mandelson is the same sort of charge as that traditionally levelled against the Tories--of preferential treatment for the rich, and of seeking for the rich privileges and passports which are denied to impoverished masses of the same colour and culture. The beautiful symmetry of the whole affair can best be appreciated by recalling that the original guru of New Labour, the man who dedicated himself to the re-writing of Clause Four of Labour's constitution, and who devoted his entire life as a minister to sucking up to the rich and expecting them constantly to come to the rescue of the Labour government, is, you've got it in one, Peter Mandelson. And look where it all got him. Recent headlines at Xmas of a serious shortage of school teachers gave the lie to New Labour's claim to prioritise education. This crisis has finally turned a feeling of demoralisation and helplessness amongst teachers into one of growing militancy. The teacher shortage has brought to the fore the huge disappointment that the vast majority of teachers feel towards the policies of New Labour over the last four years. This was the straw that broke the camel's back. The exit of Chris Woodhead and the appearance of a big boost in pay for Scottish teachers have fuelled that growing mood of resistance. In London both the NUT and the NASUWT are set to ballot all teachers over 'no cover' action. Having to cover for absent teachers in schools is now becoming part of a regular week for teachers, leading to increasing workload and stress. No matter how limited the action may be, it is an opportunity for teachers to start to organise real resistance to Blunkett's Tory policies. There is a feeling among many teachers that at last they can do something. Union meetings in schools across London are passing motions calling for action. At the centre of arguments over action are young teachers who have come into teaching recently. This new mood of resistance is not just confined to London. Over 100 teachers in Hertfordshire rallied over the teacher shortage after some schools were put onto a four-day week. Steve Sinnott, the NUT deputy general secretary, was of the speakers. Leicestershire teachers have held big union meetings around the county forcing the NUT to sanction an indicative ballot for action over 'no cover'. In some schools in Hackney teachers continue to take unofficial action, refusing to cross picket lines in support of council workers resisting a massive attack on their jobs, conditions and services. In South Yorkshire, Sheffield, Barnsley and Rotherham NUT associations are holding a mass rally in Blunkett's city Sheffield with Roy Hattersley and Nick Davies as the keynote speakers. Transport is also being officially organised by Manchester and Leeds NUT branches to bring teachers to the rally. Sheffield teachers will use the rally to set up a teacher campaign group to fight off the attacks in local schools. After years of feeling ground down teachers around the country are beginning to say enough is enough. It is time to link up the struggles alongside parents and students to defend our education service. 'We're a powerful group of workers with a powerful mandate.' These were the words of one RMT union rep at a members' meeting on London Underground's Central Line last month. An amazing 90 percent of RMT members and 75 percent of ASLEF members voted to strike, over 10,000 workers will be involved in the action. The rail unions plan to hold three one-day strikes starting on 5 February, and then on 12 and 19 February. It will be the unions' first joint strike since 1996--when only five rush hour trains ran out of 441. Although the strike is formally about the question of safety on the tube, the vast majority of workers and the public rightly see it is a fight to stop the privatisation of London Underground. The Hatfield rail crash made clear to everyone the dangers of privatisation. Tube privatisation and renationalisation of the rail have become a political hot potato for New Labour in the run-up to the election. A recent survey conducted by the rail unions found that 66 percent of Londoners are against tube privatisation. A rally about tube safety organised by rail unions last month attracted over 1,200 people. The biggest cheer went to London mayor Ken Livingstone when he promised that he would join the tube workers on their picket lines. The political outcry against New Labour's tube plans has in turn given tube workers the confidence to fight. A serious campaign to recruit underground workers has now been launched on several lines, and both ASLEF and RMT headquarters say that workers are flocking into the unions. Tube workers are also urging other unions and community groups to join them on their picket lines. The growing confidence of rank and file tube workers to take on their bosses and the belief that New Labour can be stopped means there has never been a better time to stop the privatisation of the tube. Over 40,000 car workers took part in a day of action last month in protest against General Motors' decision to close its Luton plant with the loss of 2,000 jobs. 'This is a signal that the era of the European wide strike has come,' said Peter Jaszczyk, president of the Opel workers' council at Bochum in Germany. In Luton over 2,000 workers held a 24-hour stayaway, and workers at the Ellesmere Port plant on Merseyside walked out for half a shift. These strikes and stay-aways were illegal. But the anger was so great the bosses felt they could not get away with using the Tory anti trade union laws. The solidarity from European car workers was also inspiring. In Germany over 15,000 workers organised hour long rallies outside GM's four Opel factories. Over 3,000 workers on the morning shift at the Zaragossa Opel plant in Spain walked out for the day and marched on the company's headquarters. In Belgium 6,000 workers at the Opel plant in Antwerp struck and demonstrated, and in Portugal rallies were held outside factory gates. The walk outs cost the company over ££1 million and took a 12 percent bite out of GM's daily European output. 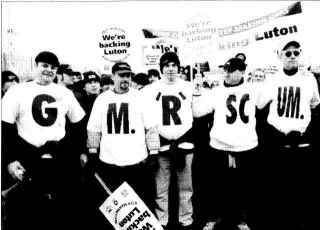 When GM announced the closure of its Luton plant just before Xmas there seemed little prospect of a fight. After all, in the last six months union officials ran away from a fight to stop massive job losses at Longbridge and sabotaged a strike vote at Dagenham. So what brought about this change? For many car workers, the closure of the Luton plant was the last straw. GM made ££1 billion profit last year and workers at the Vauxhall plants have accepted pay cuts and changes in working practices--they were promised that their jobs would be safe. So when the news of the closure was announced it exploded in the factory. Groups of workers on the morning shift laid siege to their manager's office. The late shift held an even bigger lobby and riot police were called. These protests were spontaneous and they shocked many of the union stewards into action. The shop stewards organisation in Luton is like many in the car industry. 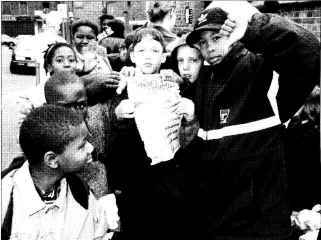 For the last 20 years it has held the union together under very difficult circumstances. The lack of a fighting spirit on the shopfloor has led many to come to the conclusion that the members won't fight. The response from the shopfloor gave the stewards the confidence to resist. The 10,000-strong demonstration in Luton last month showed everyone the mood to fight was still there. Even Sir Ken Jackson, the right wing leader of the AEEU, made, by his standards, a fighting speech. This pressure from the shop floor and the stewards has forced the national union officials to act. They have now called a strike ballot and the results should be known by the middle of February. But the national union officials have also made a strong stand because they can see the writing on the wall. Each time a car plant closes it makes it easier for another car plant to announce further redundancies. If Vauxhall closes, it would give a green light to other car manufacturers. TGWU official Tony Woodley can't afford to see one of the strongest sections of the union go without a fight. There is also a feeling among officials in the car industry that a strike at Vauxhall would not damage Labour's election chances. The backing of the national unions has been very important in raising the confidence of the workers to fight. But the national officials still shy away from really taking on the bosses. TGWU general secretary Bill Morris told reporters at the Luton march, 'The TGWU accepts that there is overproduction in the car industry.' He went on to argue that 'instead of Luton closing the job cuts should be shared across all GM plants'. This strategy will make it harder to win solidarity from other workers if all you are asking them to do is share the misery. A week-long strike by 3,000 postal workers won an important victory against Royal Mail management last month. The unofficial strike, based in Liverpool and the north west of England, was militant and involved mass pickets. The postal workers belong to the CWU, but their national officials repudiated the action. Instead of going back to work, the strikers got organised. Regular mass meetings kept the workers involved and allowed them to decide how the dispute was run. The strike had a radicalising effect on the workers taking action. Women played a very important role on the picket line and they are now planning, with the support of their male colleagues, to set up a women's committee. The strike began after management suspended a worker for allegedly abusing a manager at Liverpool's main office, Copperas Hill. As soon as the strike started all 20 delivery offices in Liverpool walked out in solidarity. To stop managers driving through the picket lines at high speed, pickets blocked entrances with railway sleepers and concrete blocks. The strike quickly spread beyond Liverpool. Over 600 postal workers struck in Crewe, which in turn led to stoppages in nine other offices. As soon as it looked like there was going to be a national strike, management caved in. The strikers broke every Tory anti-union law in the book. But it is the kind of action that has seen post workers win important victories in Oxford and Cardiff in recent months. Management, with the backing of New Labour, are desperately trying to cut costs in preparation for Post Office privatisation. Bitterness with the government is growing. At last year's CWU conference, delegates voted to disaffiliate from the Labour Party if it pushed forward with its privatisation plans. Things are coming to a head--at least 12 branches will be discussing supporting the Socialist Alliance at their AGMs this month. When even the TUC talks enthusiastically of a 'new mood of confidence' you know that times are changing. The latest report from the TUC on union recognition lists 159 new agreements last year, more than twice the figure for 1999, covering almost 60,000 people. While this figure represents rather less than 1 percent of total union membership, it is more significant than it seems because it takes in just the first six months of the new law on recognition which came into effect from June last year. All the signs indicate rising levels of membership and activity, with unions using the law as a lever to oblige employers to negotiate. So where are unions making gains, and does this mean that the tide has definitely turned? Gains are being made across the board, but most noticeably in areas where employment is growing and in the 'new' economy, transport and logistics, telecom, and call centres. By far the largest number of new recognition agreements (a third of the total) are in London and the South East, where union organisation has suffered most over the past 20 years, and where workers in the new industries were said to be indifferent to collective organisation. There is clear evidence that particular union campaigns are paying off, for example, the TGWU recruitment drive among airport workers. Areas where union organisation was previously weak or non-existent are starting to change. This is a testimony to hard work from officials and stewards, but it also shows that certain long battles have had an impact on other workers--the Lufthansa dispute at Heathrow is one example. Another important indicator is the way the employers' offensive against union organisation is now being rolled back, above all in publishing and the media, where both the GPMU and the NUJ are making gains with huge votes in favour of recognition. Although the big tasks have still to be tackled--notably the Murdoch empire. For the most part quite small numbers of workers are involved, although the TUC observes that the current recruitment campaigns are now in 'medium sized' workplaces rather than in small ones as in the past. The positive conclusion is that you don't need large workplaces to establish union organisation. Pessimists have long argued that the 'disappearance of big workplaces' meant that unions would suffer a long decline. In fact the number of large workplaces has been increasing anyway--supermarkets, call centres and so on--but this is one case where size clearly doesn't matter! The negative conclusion is that union officials are still dragging their feet when it comes to the major targets--BSkyB, Orange, the big IT firms, the new manufacturing centres. None of the current campaigns include these companies, although the TUC list only includes campaigns where union membership is 50 percent or higher. However, the overall conclusion is that union organisation is growing and the mood of confidence is spreading, confirming the evidence of growing confidence in current disputes even where these are defensive and result in stand-offs. As in football, an unbeaten run of games is the precondition for success. What we need now are some good wins. There is a new mood among civil servants. The PCS Benefits Agency and Employment Service sections held a joint conference during the last week of January. It came shortly after the stunning victory for Mark Serwotka as PCS general secretary. 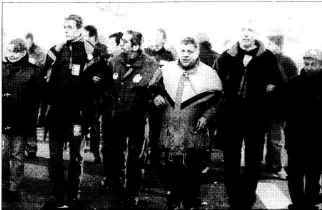 Serwotka, a socialist candidate, had stood on a platform of fighting against low pay, privatisation and lousy conditions for civil servants. This mood of resistance was seen at a pre-conference fringe meeting of nearly 170 delegates organised by Left Unity. This number was almost half the conference delegates, and many were young civil servants new to union politics. Mark Serwotka also received a standing ovation from three quarters of conference when he spoke as the general secretary elect. On top of this, conference delegates voted overwhelmingly to fight for better pay and conditions as well as against privatisation. Mark Serwotka pledged himself to lead those campaigns. That fighting mood has also been seen in recent strike action in the Crown Prosecution Service, and workers at the British Library have voted to strike over pay. The attacks from New Labour are set to continue. The benefits and employment services are set to be brought under one new agency, the Working Age Agency. The government plans to cut more jobs and conditions as well as threaten more privatisation. Barry Reamsbottom, the outgoing right wing general secretary, and a section of the bureaucracy will do its utmost to temper Serwotka's victory. However, every socialist inside the civil service needs to seize the opportunity to build the left amongst the thousands who voted for Serwotka. The conference gave a taste of what can be achieved. Mired in corruption, abandoned by his cabinet and the military, and under mounting pressure as hundreds of thousands of workers and peasants took to the streets, Filipino president, Joseph Estrada was forced to flee Manila last month. It was the ultimate humiliation for a president who led a country of 75 million people which is very important strategically for US imperialism. Estrada has been one of America's staunchest supporters in the region, and his departure will be problematic for it as the economic problems in South East Asia continue. Estrada had been accused of taking more than $8 million in bribes from illegal gambling and $4 million in kickbacks from tobacco excise taxes. He was forced to face a Senate trial hearing. This continued over several weeks. 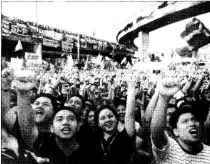 The mass demonstrations ended when the senators acting as judges in the trial decided to disallow examination of a $66 million bank account used by Estrada to amass illegal wealth. In Britain sections of the press described this as a revolt that was built with the power of mass communications through the use of mobile phones. But there was more to it: behind the headlines lurked the dirty hands of the IMF and World Bank. During the mid-1990s the Philippines seemed to be on its way to becoming one of the Asian Tigers. Growth rates were 5 percent and the economy seemed healthy. All that changed during the Asian crash of 1998. The intervention of the World Bank made things worse. A loan from it has led to repayments of $5 billion annually--close to 40 percent of total export earnings. And since then unemployment has increased massively. Many of those in work are paid poverty wages, and the Filipino economy is largely kept afloat by the $6 billion that Filipino workers who work abroad send home. Then came the Gatt agreement on agriculture. With some 60 percent of Filipinos involved in agricultural production, the effects of this were devastating. The result of the Gatt agreement was to flood the market with cheap imports. Although local production of rice--the staple food of most Filipinos--was sufficient to meet demands, under the agreement an increasing amount had to be imported. By the end of the 1990s the Philippines became a net importer of rice (mainly from surpluses created in the US), local production slumped and thousands were thrown out of work. The net effect was to devastate local agricultural production. At the height of the economic crisis in 1998 the Philippines imported $715 million of agricultural produce from the US--all under the directive of the Gatt agreement. For its part the Asian Development Bank (under instructions from the World Bank) made the liberalisation of the rice sector a prerequisite for a $175 million loan. The Estrada government willingly went along with all of this. So the recent protests were a revolt against the worst effects of global capitalism. Just a few weeks later protests also returned to the streets of Jakarta in Indonesia as thousands of students marched on the parliament building. Although the grievances of Indonesians differ from Filipinos, it serves to highlight the instability of the region, and how the brutal effects of the World Bank and IMF are forcing those at the sharp end of their policies to fight back. The assassination last month of Laurent Kabila, the president of Central Africa's Democratic Republic of the Congo (DRC), briefly focused attention on the suffering of the country's people. A meticulously researched report last year from the International Rescue Committee estimated that around 1.7 million people died as a result of the war in the northern and eastern provinces of DRC alone between August 1998 and May 2000. On average 2,500 people die every day the war goes on. The main battle is between the DRC government, now headed by Laurent Kabila's son, Joseph, and rebel armies backed by Rwanda and Uganda. All of those involved are out for their own interests. The Zimbabwean and Angolan armies that backed Kabila have grabbed vast mineral resources and secured wide control over the direction of state policy. Angola has greatly increased the number of its troops in the DRC since the assassination. But it is not just DRC's neighbours that have manoeuvred for influence in the country. The US has played an utterly destructive role in DRC (formerly Zaire). In 1965 it installed and then maintained in power the murderous regime of Joseph Mobutu. But Mobutu became an embarrassment to the west. So when Laurent Kabila first came to power in 1997, US Secretary of State Madeleine Albright described him as 'a beacon of hope'. But he then upset his US backers by reneging on deals to sell off mining concessions and by refusing to accept IMF proposals to pay off debts. Rwanda and Uganda, which have received US military aid as well as IMF loans, were initially encouraged by the US to switch sides from supporting Kabila to backing war against him. But more recently the US decided to throw its weight behind the Lusaka peace deal which included 5,000 UN 'peacekeeping' troops. The great powers, the IMF and World Bank will now try to win Joseph Kabila's ear, or to destroy him. He is presently an isolated figure with little popular support or much prospect of building it. The vast majority of DRC's people face terrible conditions, tossed between six invading armies and the great powers. The hope is that even in these most difficult circumstances brave people inside DRC have stood for peace and a more just society. They have met terrible repression. The Congolese government has repeatedly banned independent radio and television stations. In January it became an offence to report on a peace initiative launched by the churches. Activists have been arrested for 'inciting desertion' if they make the most minor criticism of the government. Despite this there were demonstrations calling for elections and political freedom in Kinshasa, DRC's capital, after Kabila's death. Colonialism and imperialism have wrecked Central Africa. The suffering is evidence of the level of cruelty and conflict which capitalism brings.